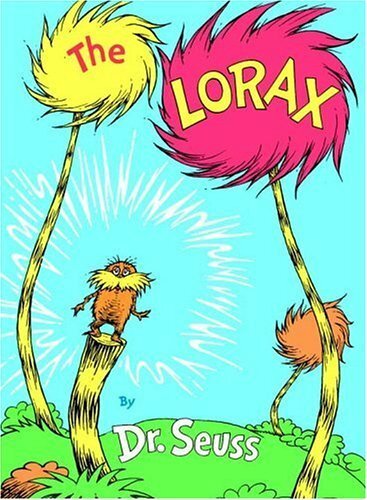 The Lorax by Dr. Seuss is a story that introduces children to the concept of environmental awareness. This book specifically discusses the importance of trees and how they help many different creatures in our world survive. In the very beginning of the story we hear from an old man named Once-ler. He tells the story of how the Lorax got lifted away to a curious young boy. A while back the land consisted of beautiful trees called Truffula Trees among the green grass, the wet pounds, and the clear skies. This land was home to many creatures, including the Bar-ba-loots, the Humming-Fish, and even the Swomee-Swans. One day the Once-ler decided that he was going to use the beautiful silk from the Truffula Trees to invent Thneeds! The Once-ler chopped down all of the Truffula Trees until there were no more. The Once-ler made Thneeds to sell to people, thinking the money he was making was more important than the environment in which all of these creatures lived. In the end, a man by the name of the Lorax conveyed the message that these trees were essential to keeping these living creatures alive. By chopping all of them down the Once-ler was hurting the environment. This beautiful land that was once the home to many creatures was now being over taken by a factory. This story focuses on the importance of maintaining the beauty of our environment and how important it truly is to do that. Element Five: Raising Awareness discusses the importance of making people conscious and knowledgeable about a particular topic or issue. The story of The Lorax raises awareness about the importance of protecting the environment. This book does an excellent job in explaining how important it is to take care of our environment and what can happen if we do not take this seriously. The character the Lorax who speaks for the trees is an excellent example of this because the Lorax is willing to stand up to the Once-ler who is only concerned about money to try and protect the creatures of the land surrounding him. 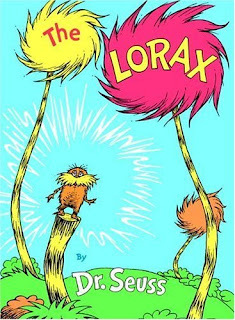 The Lorax tries to explain that the Once-ler is destroying these creatures’ homes and they are suffering physically due to all of the fumes of the factory that is overtaking this land. If there were more people like the Lorax that defended what was right, maybe the Once-ler’s factory could have been stopped much earlier on, and the land could have been saved. In addition to this, the story also does a great job with their illustrations. The author starts the story off with dark and gloomy colors where the Once-ler explains the current atmosphere of the land, transferring to bright colors to illustrate how the land used to be and back to dark colors since the land is still deserted. Lastly, the expressions on the faces of both the Lorax and the other creatures of the land show how overtaking this land with a factory had an overall negative impact on everyone involved. The message and illustrations are powerful in raising awareness about the importance of taking care of the environment we live in. An activity that I would do would focus on the very end of the story. At the end of the story the Once-ler gives the young boy the last Truffula seed that he has. The Once-ler tells the young boy to take care of this seed and grow a forest so that the Lorax and all of his friends can come back. As an activity students would plant their own Truffula seed somewhere around the school. Students would then have to write a letter to the Once-ler about how they were going to make a difference in the environment. Writing this letter would give students the responsibility of exemplifying the characteristics of the Lorax, who speaks for the trees. Students will write a letter to the Once-ler stating what they were going to do to help save the trees and the creatures that need these trees for survival. These letters will serve as promises that students are going to keep to help their environment just as the Lorax did.